Helicopter video shows authorities searching for the gunman Thursday, Nov. 29, at Florida Atlantic University in Boca Raton. Updated at 4:26 p.m. ET: Two Florida colleges were back to "normal business" Thursday after police locked them down for three hours searching for a gunman believed to have robbed a student on campus. The alleged gunman wasn't found after the robbery in the Arts and Letters Building at at Florida Atlantic University, which is in Boca Raton, about 60 miles north of Miami. 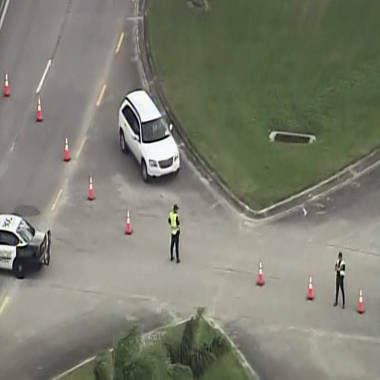 A lockdown was also lifted at the Boca Raton campus of Palm Beach State College, which is near Florida Atlantic. No shots were fired, and no injuries were reported, campus police said. Edgar Zuniga Jr. of NBC News and NBC 6 of Miami contributed to this report. Follow M. Alex Johnson on Twitter and Facebook. Florida Atlantic said the suspect is a male, about 5 feet, 10 inches tall, with a muscular build, wearing a white shirt and pants. The university told NBC Miami that he was believed to have robbed a student at gunpoint. "The suspect placed a small handgun to the victim's head and then fled on foot after taking some of the victim's possessions," it said in an email statement. The University Press, the college's student-run magazine, reported on its Twitter account that students in the complex could hear helicopters hovering overhead. "I'm scared. FAU houses the crazies," Catherine O'Rourke, a senior design major who was hiding under a table in the Visual Arts building, told the publication. Students, faculty and staff were told to shelter in place, and visitors were told to avoid the campus.